In less than three months, the 2017 edition of PSYCHO LAS VEGAS will make its descent upon the Hard Rock Hotel And Casino Las Vegas in Las Vegas, Nevada. Set to commence on August 18th and run through August 20th, 2017 with a peparty to be held on August 17th, the event flaunts a jaw-dropping lineup that includes headlining sets from Atlanta goliaths, MASTODON, psychedelic rock legends, THE BRIAN JONESTOWN MASSACRE, and heavy metal icon KING DIAMOND performing the zenith Abigail opus in its entirety as a US-exclusive. Recent additions, reunited UK doom icons WARNING, will also grace the fest alongside cult stoner/desert rock unit SLO BURN, fronted by KYUSS' John Garcia, Sleep, Wolves In The Throne Room, Ace Frehley, Neurosis, Gojira, Corrosion Of Conformity, Pelican, Chelsea Wolfe, Carcass and over seven dozen of the scene's most groundbreaking, eclectic, and plainly ruling acts. 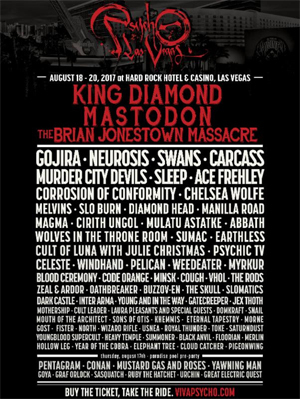 PSYCHO LAS VEGAS is already - and rightly so - being hailed as one of the best heavy lineups ever put together for an American festival. Today, PSYCHO LAS VEGAS 2017 is pleased to unveil the day-to-day lineups as well as single day ticket options. Tickets are selling fast! Don't miss out. Secure yours today at THIS LOCATION. Payment options for PSYCHO LAS VEGAS 2017 are available through Affirm, with immediate delivery of tickets. More info HERE. Hotel discounts at the Hard Rock Hotel And Casino are also available using the code "psych17" (Note: You must use this special code at the time of booking; not when you arrive at the hotel). Book today at THIS LOCATION.